Happy Halloween from the team at LMK! We’ve been carving pumpkins, hoarding candy (some of which may survive for the trick-or-treaters), and shuffling along like zombies to Michael Jackson’s Thriller every time it pops up in our Halloween playlist. We know Halloween is scary for a lot of reasons, but realizing that the album Thriller was released nearly 35 years ago might be the biggest fright of the year – scarier, even than zombies that are shuffling across the TV screen. In the case of pop music, thirty-five years might sound like a long time, but consider that, in many instances, your TMF (trial master file) might need to be archived even longer. Adding to the terror, regulation isn’t always clear about what archiving requirements apply, and lack detail when they do. 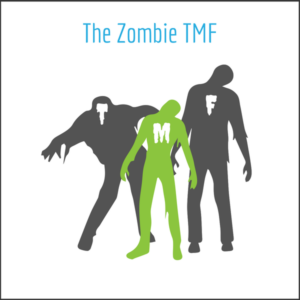 Throw in the regulatory novelty of electronic TMFs, ever-changing media formats, and the myriads of legal, operational, country-specific, local, and financial reasons your TMF might need to ‘come back from the dead’, and you might prefer to shuffle off into the moonlight to join the zombie herd. So, what are the applicable regulations surrounding your post-mortem TMF? Compliance: Have you identified which regulatory requirements apply to your TMF? Non-compliance could cause doubt about other aspects of your trial, like patient safety or the quality of the data. Security: We’ve all seen the stories in the news about Equifax. Data breeches can permanently mar the reputation of a company and invite legal and regulatory disaster. Accessibility: Consider the difficulty of copying a file from an eight-inch floppy disk. Inspectors expect near-instantaneous access to all TMF documents regardless of their varying formats, date of archiving, or the originating location. Efficiency: Inefficient archiving procedures waste everyone’s time. Any archival process must be manageable or else the human tendency to procrastinate will take over. Cost: Do your investigators realize how much paper archiving can cost as the years add up? Does your organization have the budget to support storage hardware and the people to maintain it? Does the inexpensive cloud storage solution the Sponsor’s been eyeing address the four other requirements above? No matter how spiffy a storage solution appears, if it’s unaffordable, it’s unimplementable. As you bask in the warm glow of your closed-out trial, archiving your completed TMF will be the last task on your mind. By having a plan in place before the trial starts you ensure all stakeholders in your trial are aware of their archiving responsibilities and the resources required to fulfill them. It’s truly horrifying to think that all the hard work of trial conduct can called into question months or years after the last of the data has trickled in…but poor TMF archiving practices can come back to haunt you.